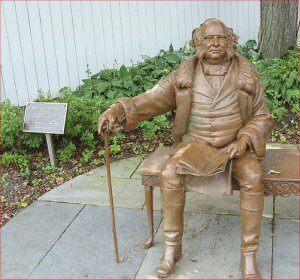 Martin Van Buren was born December 5, 1782 in Kinderhook, New York six years after the Declaration of Independence was signed in 1776. His family descended from Dutch immigrants* who came to the country from the Netherlands in the 1600's. When his father died, his mother was left a widow with three children to raise. Then she married Abraham Van Buren and they had six children, so Martin grew up in a large family. Slavery was legal in New York and the family owned six slaves who worked for them. The family farmed and also had a tavern in part of their home. Martin, as a lad, learned about politics from the travelers who stopped to rest and eat at the tavern. Through the years he met many powerful government officials who stopped there. It was also a polling place where people came to vote on election day. Martin attended a one-room schoolhouse and later a secondary school until he was 14 years old. After he finished school he got a job in a lawyer's office doing menial* chores. Later, by working as a lawyer's apprentice he became a lawyer. Politically he was what was then called a Democratic-Republican. The party had been started by Thomas Jefferson in 1792. They believed in local control and they helped the farmers who owned small farms. At age 20 after getting his license to become a lawyer, he returned to his hometown Kinderhook to practice law. One of his clients was his former boss, William Van Ness, who had been Alexander Hamilton's "second" or assistant in a duel* Hamilton had with Aaron Burr. Hamilton died of wounds he sustained in the duel. 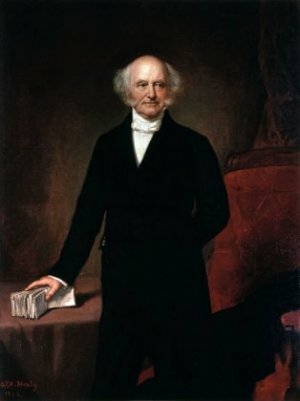 Martin Van Buren, by successfully defending Van Ness, established his career as a lawyer. He argued many cases before the Supreme Court which was in Albany, the state capitol just 20 miles away. In 1807 he married Hannah Hoes, his childhood sweetheart. The family spoke Dutch at home and English was Martin's second language. Martin and Hannah had four sons, Abraham, John, Martin Jr., and Smith. She died of tuberculosis at the age of 35 and left Martin with the four young sons to raise alone. He never married again. Within a three year period Van Buren lost three of the most important people in his life. In addition to losing his wife he also lost both his parents. He had to get family members to care for his young sons. We know that later when he became president they all came to live with him in the White House. With his political connections Martin was able to get elected to the New York state senate in 1813. During this time the United States was still at war with the British, and in 1814 Van Buren introduced a bill authorizing 12,000 men from New York to aid in the war effort of the War of 1812. In 1816 he supported a bill to build the Erie Canal which connected New York City to the Great Lakes. 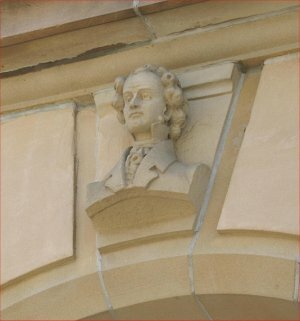 While serving in the state senate Van Buren also served as attorney general of New York. The attorney general is responsible for enforcing the laws of the state. These dual* positions gave him a lot of political clout, but he felt like his life was in danger when he was a senator and carried two loaded guns to protect himself. Later when he became president, he had police protection at the White House. One of his political foes at that time was DeWitt Clinton, and when Clinton became governor of New York he removed Van Buren from his position as attorney general. There was a group that supported Van Buren. They were called the Bucktails because they wore deer tails on their hats at the meetings. By giving jobs to his friends and political allies he was able to build a political machine which would help him to receive appointments and later get elected President of the United States. His opponents nicknamed him the "Red Fox of Kinderhook" and "The Little Magician" because of the deals he was able to make. He was small in stature, only 5 feet 6 inches tall. Andrew Jackson, once commenting on the "magician" title, said, "I believe it, but his only wand is good common sense, which he uses for the benefit of the country." In 1821 he was elected by the state legislature to serve as a United States senator. (In those days senators were not elected by the people.) There was a great debate in the Senate over the issue of slavery. It concerned whether the Territory of Florida, which had been acquired from Spain, should be allowed to have slaves. Van Buren proposed that the residents should be allowed to keep the slave they already had, but no new slaves would be allowed. This proposal pleased neither the Northerners who opposed slavery, nor the Southerners who owned slaves. In 1845 Florida was admitted as a slave state. When DeWitt Clinton, governor of New York, died, Van Buren resigned from the Senate and returned to New York to run for governor. He won the governorship and also was able to deliver the state of New York to get his political ally, Andrew Jackson, elected as President of the United States. After he had been governor for only three months, Van Buren accepted the position of secretary of state which was offered to him by Jackson. Van Buren had his eye on the vice-presidency and this appointment appeared to be a likely stepping stone to that position. In 1832 supporters of Jackson and Van Buren reorganized under the name "Democratic Party". Jackson was their nominee for president and Van Buren for vice-president. Jackson was re-elected with 219 electoral votes to 49 votes for Henry Clay, the Republican candidate and 18 votes for the other candidates. Andrew Jackson decided to weaken the Bank of the United States by pulling out the federal money and depositing it in certain state banks he favored. Those banks started issuing more paper money until paper money became worthless. Inflation was rampant* and businesses failed. The economy was in shambles and Van Buren was going to be the one to have to clean it up after Jackson retired. Van Buren was elected president in 1836. He was the first president to be born an American citizen. All previous presidents had been born before the nation gained independence from England. In that election none of the candidates for vice-president had a majority of the electoral votes, so the U.S. Senate decided on a winner, and they chose Richard M. Johnson to be Van Buren's vice-president. Van Buren enjoyed nice surroundings and during his tenure as president he remodeled the White House adding new furniture and draperies. His enemies accused him of living lavishly, dressing too well, dining sumptuously,* and using gold forks and silver plates. Since he had been a widower for 20 years there was no First Lady to entertain guests at the White House. The elderly Dolly Madison, widow of James Madison fourth President of the United States, served for a while in that capacity, then Angelica Singleton, a beautiful young woman, married Abraham, one of Van Buren's sons. The couple lived in the White House and she became its gracious hostess. While he was president Van Buren once received a gift from the Sultan of Oman, a pair of tiger cubs. He wanted to keep them, but Congress told him they belonged to the American people, and he donated them to a zoo. 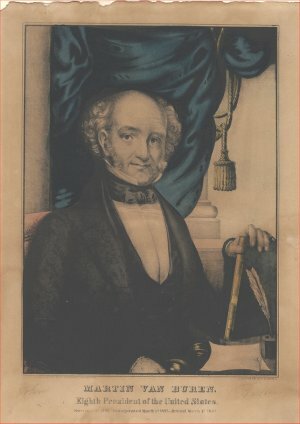 Van Buren's term as president was plagued by serious problems. There was a deep economic depression. People were rioting because food prices were so high. There was division between the North and South because of the debate over slavery, and people were being put in debtor's prison when they couldn't pay their debts. Men were hired to build more prisons for a wage of 12 and 1/2 cents a day. In 1828 Van Buren helped pass a bill that put an end to imprisoning people because they owed debts. To revive the financial situation he proposed pulling the federal money out of the state banks, undoing what Jackson had done when he put federal money into state banks. After a bitter fight the Independent Treasure Act passed. Van Buren opposed the annexation* of Texas to the union. Texas was a slave state and he feared it would further divide the country if another slave state became a part of it. He also worried it might cause war with Mexico which had controlled that area before Texas declared independence from them. In 1839 the slave ship Amistad was captured after the slaves had revolted and killed most of the crew. The slaves were taken into custody. A federal ruling would have sent the slaves back to Cuba, but former president John Quincy Adams advocated for the slaves. The United States Supreme Court issued the final decree and the captured people were free to return to Africa. The Amistad case was a problem for Van Buren. He worried about losing the Southerners vote if he sided with the slaves, yet he had to abide by the Supreme Court ruling. During his administration there was conflict with Native American Indians. The Cherokee Indians were forced to move to reservations and 4000 of them died on the Trail of Tears as they were being relocated. In wars with the Seminole Indians 2000 U.S. soldiers were killed as the Indians were forced to move west. In 1840 Van Buren lost his bid for re-election to William Henry Harrison. Harrison at his inauguration gave a long speech, an hour and 40 minutes. It was a cold rainy day. He later became ill and died less than a month after he became president. His vice-president john Tyler took his place and served out the term. 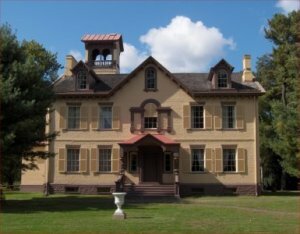 Now free of presidential responsibilities, Van Buren returned to Kinderhook and bought a large estate called Lindenwald, paying $14,000 for the house and 200 acres of farmland. It was named Lindenwald because there were many linden trees on the property. He raised potatoes, turnips, and other crops. Martin's friends called him "OK" using the initials of "Old Kinderhook", the name of his hometown. OK eventually came to have the meaning of something being "all right". In 1844 Van Buren again tried to get the nomination to run again for president, but James K. Polk was nominated and won the election. In 1848 the Free Soil Party was formed. They wanted to restrict slavery in the new states joining the union. Van Buren and his son formed a group that others called the Barnburners. The title came from a story which told of a farmer who burned his barn to get rid of the rats. 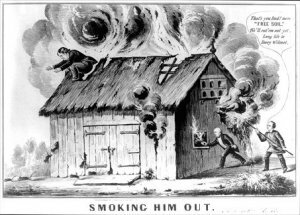 The Barnburners joined the Free Soil party and nominated Van Buren in 1848, but Zachary Taylor, who was the Whig* candidate, won the election. This was Van Buren's third attempt to get re-elected president. He gave up after that and didn't try again. For the next two years he toured Europe and lived in Italy for a while. Abraham Lincoln became president. In 1861 when the Civil War started, Van Buren supported Abraham Lincoln. He had previously been a slave holder, but on one occasion when one of his slaves ran away, he didn't try very hard to retrieve him. Over the years his ideas changed. He thought slavery was morally wrong, but when he was president it was constitutionally allowed and he had to uphold the Constitution. Martin Van Buren didn't live long enough to see the end of the slave question. He died on July 24, 1862 at the age of 79. His surviving three sons inherited Lindenwald which at that time was valued at $225,000. "The less government interferes with private pursuits, the better for general prosperity." This biography by Patsy Stevens, a retired teacher, was written January 13, 2013. Press "Go" to search for books about Martin Van Buren. This page displayed 18,209 times.